DryBell’s Vibe Machine has been one of my favourite UniVibes since its release a few years back so when they launched the new Unit67 I though “this looks very interesting!”. Here’s my review. The Unit67 is surprisingly refreshing offering something new based on old and classic circuits. I’ve never seen anything like it anyway. It’s a compressor, EQ and booster in one pedal and I have to say, it sounds damn good! In fact it’s probably one of my favourite pedals, which is a huge kudos I guess as it’s been out for only a couple of months. It’s really one of those pedals you just want to leave on all the time and as much as I’ve said that before about other pedals, this is really one you want to leave on all the time! So, the Unit67 is based on that classic 1176 studio compressor. Super smooth and transparent compression, controlled by a two mode input toggle (Low +4dB gain, lower compression and High +10dB gain, long sustained notes) and a master control for the compression controlling the amount dry/wet. The big volume control controls the amount of clean boost, which is quite considerable. This feature alone is capable of driving the front end of your tube amp into smooth overdrive. The third feature is the EQ section. Unlike most EQs or tone controls, this is based on the old Range Master treble boost. Range adds more mids based on the Rangemaster, lows more lows and high adds a bit of sparkle. Unlike your typical EQ, the Unit67 ads more grit and presence, much like those old treble boosters. It’s always hard to describe how an EQ actually sound but the high control in particular, opens up the tone and adds a lot of presence that makes your guitar cut through effortlessly. I’ve pretty much stuck with the first setting I tried. Volume at noon, EQ on with all the controls slightly above noon and the compressor in Low mode, with the sustain slightly above noon. This adds a slight boost to your tone and everything else sounds better, without actually doing much. It’s subtle but you can feel how the sustain is improved and how the guitar seem to pop out of the mix, without sounding overwhelming. Like any other compressor, I’ve placed it first in my chain allowing it to interact with the pickups and driving both the front end of my dirt pedals and amp. But really, you can place this anywhere depending on what tones you want and where that tone sculpting is needed. For me it’s a leave on all the time pedal although I often use it to boost a solo or a certain part of a song. It adds character and sparkle to a tube amp, adds a bit of boost and presence to an overdrive and tightens up a Big Muff adding a bit of mids and compression. It seems that most of the reviews I’ve seen are pretty unanimous. 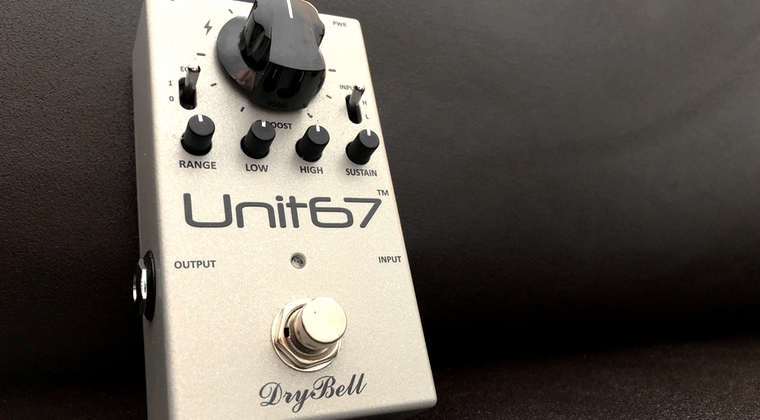 The Unit67 is a huge surprise and a much welcomed tool or tone enhancer. Definitely one that will be on my board for a very long time! Greetings Bjorn! Thanks for another great review. I have an Effectrode PC-2A Compressor that I really like, but how does the Unit 67 compare? I’m happy with the PC-2A but always looking for that next improvement to my board. Would the Unit 67 give me anything I’m not really getting now? If so, would it be significant? I’m not concerned about the cost if it’s worth it but also don’t want to spend unnecessarily. Thanks! The 67 replaced the PC-2A on my board. The PC is more of a dedicated compressor but the 67 does compression very well with that subtle studio quality optical compression. The 67 has volume boost and a very cool EQ section as well, which allow you to tweak your tone with a more vintage flavour. I would definitely say that it’s well worth checking out even if you still want to keep the PC. Thanks for the reply Bjørn. I was thinking about the boost and EQ after I wrote. Looks like I’m getting the 67. I can then move my PC to my backup board replacing the Boss. Thanks again. Well, the Demeter has more controls and in that sense a more dedicated compressor. Having said that, the Unit 67 replaced the Effectrode PC-2A on my board. I never though it would and obviously it’s a matter of taste, but the 67 is just doing the job perfectly. You know what would be swell, Bjorn? If it had two footswitches on it: one for the boost section, and one for the compressor. Well, yes I guess so but I like to have a bit of compression going all the time. It’s very subtle so to me it just sounds better with it on. Yeah, but with two separate footswitches – one for the compression and one for the boost, you could keep the compression all the time and just switch the boost on or off. From what I’ve understood, as it is, it switches the compression and the boost on or off simultaneously. How does it compare to the Electronic Orange MoonVibe? Not at all. This is a compressor. Been waiting a very long time since I bought my DryBell vibe machine, which I got one of the first that could use just about any expression pedal to change the speed, and included all of the first set of improvements Zvonch added after the first 700 or so. Obviously he takes his time perfecting a pedal before he starts designing another. I can’t wait to get my hands on his newest creation, but I’m torn! Should I get the first run, or wait until he has perfected it, or get one now, and when he figures out all the mods he wants to do, get another one? LOL, What do you think my Jedi Master? I’ll take your word for that, and am saving up for one! what about Christie’s “Spring Sale” of DG’s most iconics guitars (including the Black Strat)? It’s a good sign when the first settings you try sound great. That means it’s a quality pedal and won’t require constant tweaking. ThatsT my Stu Castledine V2 Violet RamsR head clone in a nutshell. It came to my eagerly waiting hands via UPS, or Fed EX? I took it inside, plugged it in, turned everything to 12:00, and IINSTANT DOGS, DRY SOLO, and I mean every nuance!!! I got the prototype, which I’m not sure, but believe he either used less expensive components, or raised the price on subsewysub units, as he mentioned that he lost money on the first one, which is the one I got. But regardless of the awful videos of the pedal, done by players who dontd understand the Big Muff, I’d put my V2 side by by side by DG’s #1, and truly believe anyone would have a hard time finding any difference between them. Guess that’s why I’ve seen them on eBay for over $700.00!!! Bjorn, as this expensive POS phone only changes the words once I post, is there any kind of editing function in this program? I’m a very proficient speller, and hate seeing what I type turned into some garbled mess ? No, there’s nothing as far as i know. I don’t see your end but, no there isn’t. A tip would be to write in word or text kind of doc on your phone and copy paste :) But, who cares? As long as you’re around and post once in awhile I’m happy!